Whenever continuous manufacturing is discussed, concerns over the concepts of ‘batch’ and ‘batch release’ are frequently raised. It is worth discussing the definitions of both batch and continuous manufacturing further. 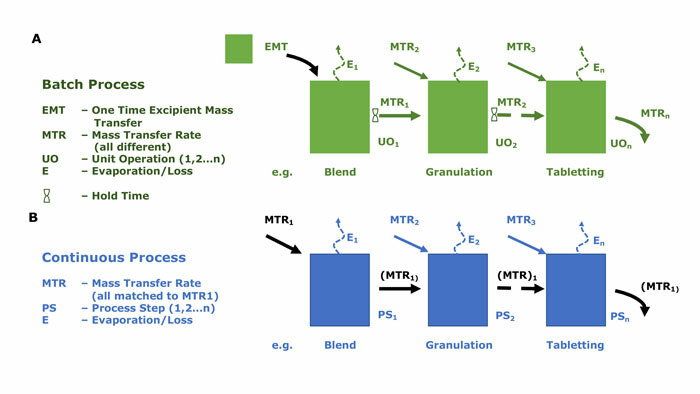 In batch processing, input materials, ie, API, water and excipients, are added to the system at the beginning of the process and the product is later discharged in its entirety, after proceeding through a series of unit operations (see Figure 1A). Intermediates are typically held for designated time periods before the full process (eg, powder blends, tablet cores, etc) is completed, as the unit operations often have different mass transfer rates. Some of the unit operations in the process could be considered as continuous, but the overall process is still completed in discreet batch modes. All material from one discreet batch is labelled with the same lot number. In continuous processing, the input materials are continuously added and product discharged from the system, throughout the duration of the process (see Figure 1B). Thus, the output from each processing step moves continuously forward to the following processing step without a holding time. All process steps have the same rate of mass transfer and each must deliver material with suitable characteristics for input into the subsequent processing step, and the overall process runs at the rate of the slowest processing step. Labelling of material at the end necessarily involves some aspect of timestamping (instead of traditional batch numbering) to maintain traceability. Therefore, a ‘batch’ has ‘uniform character and quality within specified limits’. This is obviously closely linked to the product’s control strategy, which ensures that the process is always under control.13 The ‘batch’ definition also encompasses the total elapsed time of the production process, any variations encountered during production (ie, different lots of input material), the amount of product produced, and other parameters. One such important parameter includes ensuring appropriate traceability of all input materials at all times, allowing a complete reconstruction of the batch history. Some commentators have proposed a traceability resource unit (TRU).14 Traceability is particularly important in cases of product investigations, ie, out of specification (OOS), out of trend (OOT), consumer complaints or product recalls.5 There must be defined processes for start-ups and shut-downs, together with acceptance criteria for determining when product collection starts, or re-starts, as this is a significant part of the overall control strategy. This, in turn, necessitates greater levels of interaction/communication between the various parties. Is the design space scalable? Are all the CPPs and CQAs scalable? Are there additional critical attributes observed after scaling? The ability to identify, isolate and reject non-conforming material in real-time (or near real-time) is one of the key aspects of any continuous manufacturing control strategy.13 Thus, the evaluation and subsequent understanding of the reasons for such issues, the proportion of the batch affected and the justification for remedial measures are very important. As a consequence, a process control system needs to have at least the following features: a) rapid and controlled start-up and shutdown procedures (to minimise losses) b) continuous compliance of all CQAs by achieving steady-state conditions, and c) an assurance of quality irrespective of any system uncertainties or disturbance.21 This, in turn, necessitates various feedback, feed-forward control measures, etc, and the ability to trace OOT material or process inputs to a specified finished material. However, the linking of the on-line PAT monitoring system to the control system to facilitate this feedback/feed-forward control strategy still presents a significant challenge. Real-time release testing (RTRT) is an integral part of the control strategy for a continuous process, as it allows for an active control system that can monitor the quality attributes of all incoming materials in real time using PAT. Process parameters can then be automatically modified to ensure conformance with the established acceptance criteria.13 RTRT can be applied during any stage of an API or drug product resulting in the exclusion of some, or indeed all, of the specified tests.22 That is, it is desirable to have so many on-line PAT measurements that off-line analysis is not fully required. However, the reality is that the sensitivity and selectivity of spectroscopically based PAT tools are not currently aligned with existing ICH Q3A23/Q3B24 impurity expectations. Many of the manufacturing process steps that are required for continuous manufacturing already exist within many contract manufacturing organisations, eg, Catalent, where processes such as extrusion, roller compaction, tabletting and encapsulation are all recognised as continuous unit operations. Further consideration of the manufacturing, quality, regulatory and analytical/PAT/big data issues are required to develop the capabilities to support continuous manufacturing. Recent product launches have shown that both industry and regulators are willing to embrace continuous manufacturing in order to take advantage of key benefits that have already been demonstrated in other industries. 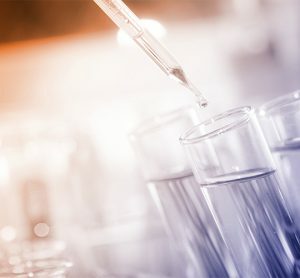 In all likelihood, industry’s preferred strategy will be not to develop continuous manufacturing for NDAs in the short term, due to the costs and risk associated with tech transfers, and that it will be many years before even 50% of new products will be made using continuous manufacturing. The initial investment necessary for continuous manufacturing is significant and includes novel equipment with limited prior knowledge. But in the long term, continuous manufacturing is more efficient and cost-effective than its batch counterpart. Data integrity is a current regulatory focus and the integrity of big data could present significant implementation challenges, but the overall patient benefit is likely to ensure that the development of continuous manufacturing progresses with increasing pace. Stephen Tindal is Director, Science & Technology, at Catalent Pharma Solutions. He holds a Bachelor’s degree in Chemistry and Analytical Science from Loughborough University, UK. Stephen has worked at Catalent for 30 years, holding positions in R&D responsible for the formulation, process development, and clinical and commercial operations. He is part of Catalent’s Science and Technology Team and is based in Somerset, New Jersey, USA. Ronak Savla is Manager, Scientific Affairs, Catalent Pharma Solutions. He received his PharmD and PhD degrees from Rutgers University. Ronak joined Catalent Pharma Solutions as a postdoctoral fellow in 2014 and transitioned to his current role as the Scientific Affairs Manager in June 2016. Ronak is a co-author of over 40 peer-reviewed papers, posters and articles. Pharmaceutical cGMPS for the 21st Century – A Risk-Based Approach: Second Progress Report and Implementation Plan, 21 August 2002. Hernan D. Continuous manufacturing: challenges and opportunities: EMA perspective. 3rd FDA/PQRI Conference on Advancing Product Quality, March 22-24, 2017. Mandate of the EMA Innovation Task Force (ITF). 6 August 2014, EMA/484400/2014, Human Medicines Research and Development Support Division. Advancement of emerging technology applications to modernize the pharmaceutical manufacturing base. Guidance for Industry. Centre for drug evaluation and research (CDER). December 2015. Lee SL, O’Connor TF, Yang X, Cruz CN, Chatterjee S, Madurawe RD, Moore CMV, Yu LX, Woodcock J. 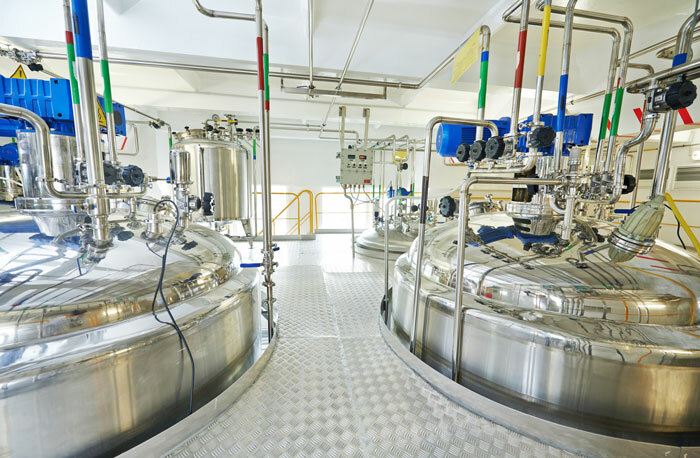 Modernizing Pharmaceutical Manufacturing: from Batch to Continuous Production. J Pharm Innov. 2015;10(3):191-199. Van Arnum P. Manufacturing trends in continuous mode. Pharm. Technol. 2015. http://connect.dcat.org/blogs/patricia-van-arnum/2015/09/18/manufacturing-trends-in-continuous-mode#.WWX18ITyvng. Accessed on 12 July 2017. Pharma Manufacturing. 2016. Advances in Pharmaceutical Supply Chain: Continuous Manufacturing (CM). https://www.pharmamanufacturing.com/assets/Media/2016/1604/Janssen-CM.pdf. Accessed on 29 July 2017. Healthcare Industry 07Jun2017. https://www.gesundheitsindustrie-bw.de/en/article/news/industry-40-pfizer-opens-continuous-manufacturing-plant-in-freiburg/. Accessed on 29 July. 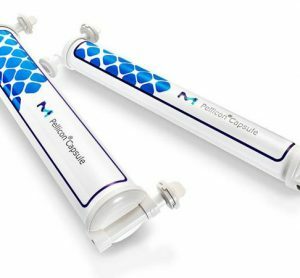 Glaad T. Merck’s Path To Continuous Manufacturing For Solid Oral Dose Products: What Stands In The Way? 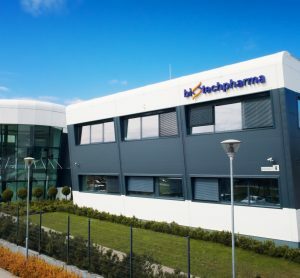 Life Science Leader, 8 December 2016. https://www.lifescienceleader.com/doc/merck-s-path-to-continuous-manufacturing-for-solid-oral-dose-products-what-stands-in-the-way-0001. Accessed on 29 July 2017. Stanton D. Pfizer: Global regulatory divergence restricted continuous manufacturing ambition. In-PharmaTechnologist. 29 June 2017. http://www.in-pharmatechnologist.com/Processing/Pfizer-on-continuous-manufacturing-and-regulatory-divergence. Accessed on 29 July 2017. Webb D, Jamison TF. 2010. Continuous flow multi-step organic synthesis. Chem Sci. 2010;1(6):675-680. Baxendale IR, Braatz RD, Hodnett BK, Jensen KF, Johnson MD, Sharratt P, Sherlock J-P, Florence AJ. Achieving continuous manufacturing: Technologies and approaches for synthesis, workup and isolation of drug substance May 20-21, 2014. Continuous manufacturing symposium. J Pharm Sci. 2015;104:781-791. Lee SL. Current FDA perspective for continuous manufacturing. MIT-CMAC 2nd International Symposium on Continuous Manufacturing of Pharmaceuticals, September 26-27, 2016. Moe T. Perspectives on traceability in food manufacture. Trends in Food Sci. Technol. 1998;9:211-214. ICH Q9. Quality Risk Management. Current step 4 version, 09 November 2005. ICH Q8(R2). Pharmaceutical development. Current step 4 version, August 2009. Byrn S, Futran M, Thomas H, Jayjock E, Maron N, Meyer RF, Myerson AS, Thien MP, Trout BP. Achieving continuous manufacturing for final dosage formation: Challenges and how to meet them May 20-21, 2014 Continuous manufacturing symposium. J Pharm Sci. 2015;104:792-802. Boukouvala F, Niotis V, Ramachandran R, Muzzio F. Ierapetritou MG. An integrated approach for dynamic flowsheet modelling and sensitivity analysis of a continuous tablet manufacturing process. Comput Chem Eng. 2012;42:30-47. Lakerveld R, Benyahia B, Braatz RD, Barton PI. Model-based design of a plant-wide control strategy for a continuous pharmaceutical plant. AIChE J. 2013;59:3671-3685. Cole KP, McClary Groh J, Johnson MD, Burcham CL, Campbell BM, Diseroad WD, Heller MR, Howell JR, Kallman NJ, Koenig TM, May SA, Miller RD, Mitchell D, Myers DP, Myers SS, Phillips JL, Polster CS, White TD, Cashman J, Hurley D, Moyla R, Sheehan P, Spencer RD, Desmond K, Desmond P, Gowran O. Kilogram-scale prexasertib monolactate monohydrate synthesis under continuous-flow CGMP conditions. Science 2017; 356:1144-1150. Rantanen J, Khinast J. The future of pharmaceutical manufacturing sciences. J Pharm Sci 2015;104:3612-3638. Elder DP. An overview of process analytical control. Eur Pharm Rev. 2017;20(6):44-47. ICH Q3A(R2). Impurities in new drug substances. Current step 4 version, 25 October 2006. ICHQ3B(R2). Impurities in new drug products. Current step 4 version, 02 June 2006. Schilling EG, Neubauer DV. Acceptance sampling in quality control. Boca Raton. 2009. 2nd Edition, CRC Press. Eur. 2.9.47. Demonstration of uniformity of dosage units using large sample sizes. Ph. Eur. 9.0: 384. Page T, Dubina H, Fillipi G, Guidat R, Patnaik S, Poechlauer P, Shering P, Guin M, Jonston C. Equipment and analytical companies meeting continuous challenges May 20-21, 2014 Continuous manufacturing symposium, J Pharm Sci. 2015;104: 821-831.